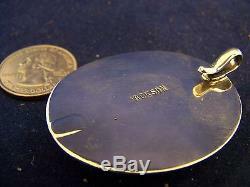 Tommy Jackson Sterling Silver Pendant. With Natural Gem Kingman MineTurqouise. 2.12" X 1.58" Total pendant with the bale. 1.89" X 1.58" Total with out the Bale. Stamp Signed "JACKSON" on the reverse. 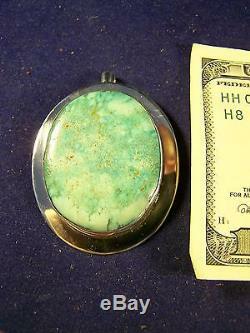 The Tommy Jackson Gem Turquoise Pendant. 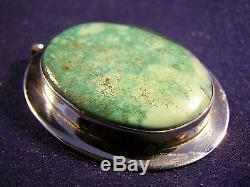 This wonderful Necklace Pendant was made by the famous Navajo smith Tommy Jackson. His work can be found in countless museums and galleries. 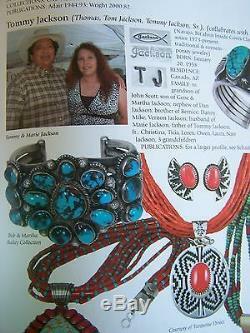 It can also be found in all the major Native Jewelry catalogs and reference books. A few are listed below. 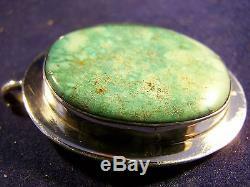 He has traded with me and even done quick repairs on a buckle I happened to be wearing several years ago that had a stone loose in its bezel. I like to chat with him about various artists, stamps, turquoise, etc. He loves people and loves to make amazing jewelry. This item comes to us with a story. Years ago, Tommy made some "Triple Buckle Sets". A number of people only used two of the three buckles and the "middle buckle" did not get utilized. Yes, this was "reassigned" from an unused middle buckle. 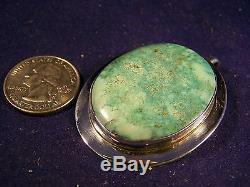 Michael Contreras did a beautiful job of creating a pendant from a buckle. Michael is one of six jeweler-sons of Alberto Contreras. Alberto worked with Frank Patania Sr. 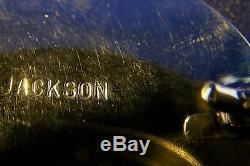 This is stamp signed with the hallmark "JACKSON" and is guaranteed to be Sterling Silver and authentic. I'd like to note that Tommy has used several stamps during his career. His uncle is the 14 years older and also famous Dan Jackson. Dan normally uses his last name only as a hallmark. I do not believe that Dan ever made this type of item. If you follow Native Jewelry, I'm sure you are aware of artists in a close family that share techniques, stamps, tools, designs, and even hallmark stamps. The Becenti brothers come to mind. I just had a confusing situation with a Frank Vacit or Bessie Vacit pair of earrings as the late father Frank and his daughter Bessie used the same hallmark stamp. I recently discussed these pieces with Tommy Jackson at the Native American Exposition that is part of the Tucson Gem and Mineral Show here in Tucson this February. 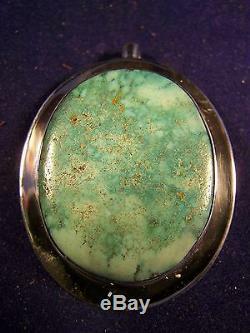 I did not anticipate seeing him there so I did not have this pendant with me to show him. Based on our discussion and the circumstances that I mentioned, this can be attributed to Tommy Jackson. There are no defects like cracked or loose stones, scratches, etc. 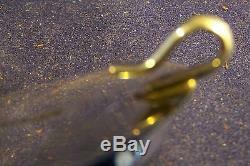 The Necklace is in very good condition and may have been used very little. I believe you will be pleased! 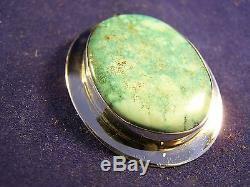 W hen you take a look at the pictures, please inspect the the Gem quality Turquoise Stone. It is quite elegant and can be worn with a silver chain or (since the bale is open) slipped over the chain of your "Navajo Pearls" as an enhancer. Your friends may compliment you and your taste in Navajo Jewelry. Recommended Reference Books - This artist is referenced if there is a page # shown below. "AMERICAN INDIAN JEWELRY I" - Gregory Schaaf - page 189. "AMERICAN INDIAN JEWELRY II: A-L" - Gregory Schaaf- pages 267. "HALLMARKS OF THE SOUTHWEST"- Barton Wright - page 83. "THE LITTLE BOOK OF SOUTHWESTERN SILVER" - Billie Hougart - page 161. "ZUNI JEWELRY" - Theda and Michael Bassman. 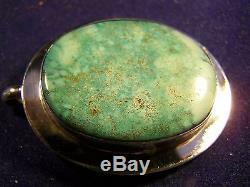 The item "TOMMY JACKSON Pendant 1.8 X 1.5 signed Navajo GEM TURQUOISE Sterling Silver" is in sale since Thursday, October 19, 2017. 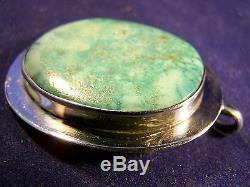 This item is in the category "Jewelry & Watches\Ethnic, Regional & Tribal\Native American\Necklaces & Pendants".
" and is located in Tucson, Arizona. This item can be shipped to United States, Canada, United Kingdom, Denmark, Romania, Slovakia, Bulgaria, Czech republic, Finland, Hungary, Latvia, Lithuania, Malta, Estonia, Australia, Greece, Portugal, Cyprus, Slovenia, Japan, China, Sweden, South Korea, Indonesia, Taiwan, Thailand, Belgium, France, Hong Kong, Ireland, Netherlands, Poland, Spain, Italy, Germany, Austria, Israel, Mexico, New Zealand, Philippines, Singapore, Norway, Saudi arabia, United arab emirates, Qatar, Kuwait, Bahrain, Croatia, Malaysia, Chile, Colombia, Costa rica.